Not too long ago we published a post detailing the adventures of two people who didn’t know how to use their truck loading ramps correctly. We have also published other posts which discussed tow truck fails brought on by inadequate understanding of standard operating procedures. Those kinds of stories are always a reminder of how much we appreciate tow operators who really understand their profession and work hard to be good at it. Towing isn’t as simple as attaching a hook to a car and driving away. There is so much more to it than that. Tow operators have to consider everything from the vehicle being recovered to the kind of recovery being undertaken. They must decide whether to use webbing straps or towing chains; whether to make use of a hook truck or a flatbed; and whether it is really safe to secure a recovery vehicle using just tire nets. None of what we just described even touches the most complex recovery jobs. As an example, consider a recovery this past summer (2018) out of Phillipsburg, New Jersey. It required not only savvy tow operators with knowledge and experience, it also required the right tools and equipment. June 22 was the day a local Phillipsburg towing company was called to Heckman and Marshall streets around early in the morning. Apparently, a Case digger was preparing the site for future utility work. While the operator was busy digging a trench for utility workers, the pavement under the left side of the machine gave way. The digger fell into the resulting hole. Half of it ended up in the hole while the other half remained outside, perched at roughly a 30° angle. Making matters worse was the fact that the digger was resting right on top of a gas line. Tow operators called to the scene had to figure out how to get the machine out of the hole without allowing it to slip. One slip could have severed the gas line and caused a major problem. As you can imagine, it was impossible for the tow truck operators to just hook up a chain and drag the digger to safety. First of all, the machine was too heavy for that sort of thing. Second, it had to be lifted straight up in order to protect the gas line underneath. Trying to drag the digger would have probably ruptured the line and further weakened the surrounding pavement. It took a team of two tow operators about an hour to come up with a plan and then successfully execute it. It was an hour of touch-and-go. In the end, they used a combination of two boom trucks equipped with heavy towing chains to slowly lift the digger out of the hole. The two trucks were positioned on the opposite side of the street, front to back. Their booms were extended out over the digger so as to transfer all its weight to the stronger pavement. Then the two operators used remote control devices to slowly pick the machine up. They had to synchronize their movements to keep everything steady. It is fortunate that the operators were very experienced, had good judgement and also had the right tools at their disposal to handle what was a very dangerous job. We are guessing they weren’t using cheap towing chains and hooks on something so heavy. Incidents of this kind are a reminder of how important is it be a good tow operator. One of the things we try to consistently do here at Mytee Products is remind our customers to pay attention to their inventories. For example, consider tow truck operators. We are thrilled to be able to serve operators across the country who rely on us for towing chains, straps, lights, and a whole host of other supplies. We do our best to remind them to make sure their trucks are always fully stocked. This really is a no-brainer for most tow operators. But every year there are new operators joining the industry and just getting started in their careers. Their lack of experience may lead them to take a job without having the proper equipment to do it safely and completely. If there is one thing that we have learned from working with tow operators over the years, it’s that you never know what you’re going to come up against on any recovery. We will be well on the way toward rough winter weather by the time this post is published. So let’s use a recent example from the past to illustrate why it’s necessary to keep a tow truck fully stocked. The example comes out of Maple Hill, North Carolina in the aftermath of Hurricane Florence. On September 19 (2018), a truck pulling a mobile home behind it was blown over by hurricane-force winds. That mobile home was destined to be a rest station for hurricane recovery workers in need of rest. Unfortunately, Florence saw to it that the trailer never made it to its designated location. The state Highway Patrol had to call for assistance to right the trailer as quickly as possible. Under normal circumstances, this would have been difficult enough. The job probably would have required multiple tow trucks using chains and winches to get the trailer back in an upright position. But this was no ordinary circumstance. Florence pounded the Carolinas for some 30 hours in total. By the time tow trucks were dispatched, the trailer was already under 10 feet of water. The team of four tow operators all arrived on scene and realized it was going to be a tough job. Even after the water had receded, righting the trailer/mobile home required precise techniques and the proper use of the right equipment. It’s a good thing the tow operators knew what they were doing. Even with 4 feet of water still inside, they managed to pull the trailer upright and move it to the shoulder. The success of these four tow operators is a testament to their abilities, experience, and equipment. Their story is also a reminder that tow operators have to be prepared for anything. No one knew just how bad Florence was going to be, but every person who knew that he or she was going to be involved in the cleanup had to be as prepared as possible. As a tow operator yourself, you may never experience anything like the damage caused by Hurricane Florence. But you’ll still see your share of stranded cars, highway accidents, repos, and municipal tows. Your truck needs to be fully stocked with everything you need to do your job safely and correctly. Mytee Products has you covered. We have a complete inventory of towing chains, mesh straps, tire nets, hooks, winches, and even towing lights. If you need it to stock your tow truck, we probably have it. And if we don’t, we’ll still do our best to get it for you. Don’t head into the busy winter season without knowing full well that your truck is fully stocked. An interesting series of events occurred in St. Paul, Minnesota in the spring of 2018. The region was subject to its sixth snow emergency of the season thanks to a whopper that descended on the Twin Cities in mid-April. What happened on the city’s streets over the weekend of April 14 serves as a reminder to tow operators that snow is coming and it might be a lot of it. So, get your trucks stocked with towing supplies now. 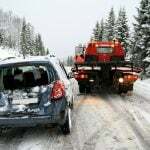 Towing vehicles during snow emergencies is standard operating procedure for most major cities. It just makes sense. Snow plows cannot clear the roads effectively if they are littered with cars. Moreover, plows traveling down the street will block in any cars that are not moved. Cities tow for both the benefit of plow operators and car owners alike. What happened in St. Paul may have been unusual, but that doesn’t change the fact that tow truck operators across the country will be called on this winter to clear streets during snow emergencies. It is part and parcel of the towing game in urban environments. The only question that remains now is whether tow operators are prepared for the coming workload. Mytee Products cannot help with driver training, truck maintenance, insurance issues, etc. But we do stock an entire inventory of towing supplies. We are here to help you make sure your truck is fully stocked in advance of the coming winter. And if your company owns multiple trucks, you can buy all your supplies from us. Be sure to check your inventory of towing straps. Not only should you have an ample number, but each of your straps should be in good working order as well. Check towing straps for wear and tear and broken buckles or hooks. Check your towing chains as well. Towing chains can rust over the summer months while in storage, so give each chain the once over. We encourage tow operators to also pay attention to lighting. In most states and local municipalities, tow trucks are required to be equipped with some sort of lighting to designate when the truck is engaged. For most tow truck operators, that means amber dome lights or light bars mounted to the roof of the truck. If your state or local municipality also requires temporary lights attached to the towed vehicle, we have those too. Temporary lights are fixed to the towed vehicle by way of powerful magnets. They are also connected by cable to the truck’s electrical system so that they work in sync with the truck’s break lights, tail lights, and turn signals. Winter is coming, and it is coming fast. That’s good news if you’re a tow operator who relies on the extra business of the season to boost revenues. Just don’t be caught off guard. Make sure your truck is fully stocked before the first snow emergency is declared in your local area. America has a lot of unsung heroes who really don’t get the recognition due to them. Among them are tow truck operators who risk their lives every day to recover broken down vehicles. We appreciate the efforts of these towing professionals , which is a primary reason for our decision to stock tow truck supplies including chains, hooks, winches, and towing straps. This is the time of year we start hearing some of the wildest and craziest stories from tow operators. The later we get in a year, the wilder and crazier those stories will become. You see, winter weather makes already dangerous conditions absolutely treacherous for roadside recoveries. Any tow truck operator who has worked a winter on snow and ice-covered roads can tell stories that would make your hair stand on end. We say all of that to say this: it is absolutely vital for tow operators to make sure they have all the right equipment on board to safely recover broken-down vehicles. But it is also critically important that operators know how to use that equipment the right way. A little knowledge goes a long way toward both effective and fast vehicle recovery. It is obviously necessary for tow operators to properly secure recovered vehicles with chains and straps before departing. To that end, rushing through a recovery job is not a good idea. But at the same time, a tow operator wants to get in, hook up, and get out as quickly as possible. Lingering for too long is an open invitation to trouble. Knowing how to use towing equipment the right way increases both safety and speed. In terms of safety, a properly secured vehicle is a lot less likely to break loose during transport. That should be obvious. But let us talk about the speed question. Remember that a tow operator doesn’t want to hang around on the side of the road for too long. If you have seen a professional lumberjack competition, you will notice that the men and women competing for the top prize can hack through a log in mere minutes. They are fast and efficient because they know how to use their tools. The same principle applies to operating a tow truck. A tow operator who knows how to use his or her equipment can, and should, practice doing so. It should become second nature so that, on any given recovery job, the operator doesn’t have to spend 15 to 20 minutes figuring out what needs to be done. The more efficiently an operator can deploy chains and straps, the more quickly he or she can get out of harm’s way. Another side to towing equipment is knowing what is needed to complete most recoveries. For example, every tow truck is going to be equipped with a basic inventory of chains, straps, and hooks. But let’s say you operate a towing company in north-central Pennsylvania. Your trucks could be recovering a lot of vehicles from the mountain passes of I-81 this winter. Your trucks might also need to be equipped with motorized winches and heavy-duty cables. Otherwise, how are you going to get those cars that have managed to find their way into ditches? Once recovered, your drivers may have to deploy some creative tiedown methods to overcome car damage. Recovering broken-down vehicles is always a sticky situation. Doing it during the winter adds an extra element of danger brought on by severe weather. If you are tow operator, we implore you to make sure you know your tow equipment and how to use it.